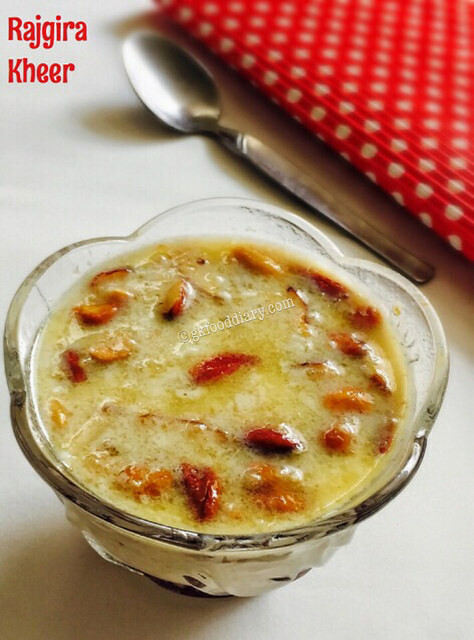 Rajgira Kheer – delicious and healthy pudding/kheer made with rajgira aka amaranth grains, milk and nuts. 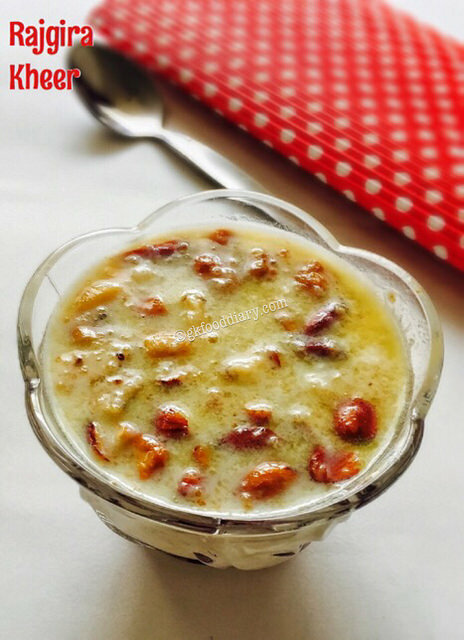 This is one of the tastiest dessert you can make with rajgira and its the best way to include this healthy grains in your kids diet. 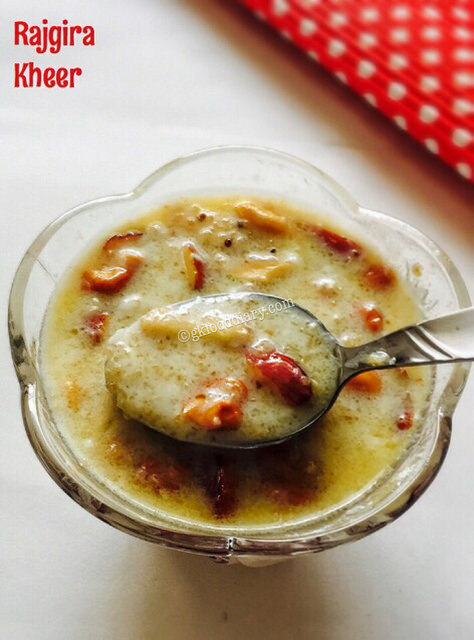 The calcium rich rajgira kheer can be given to babies from one year as a quick dessert, but make sure to add powdered nuts instead of whole nuts while preparing this kheer for babies below two years. Check more information on health benefits of rajgira, when and how to introduce the same to babies here. 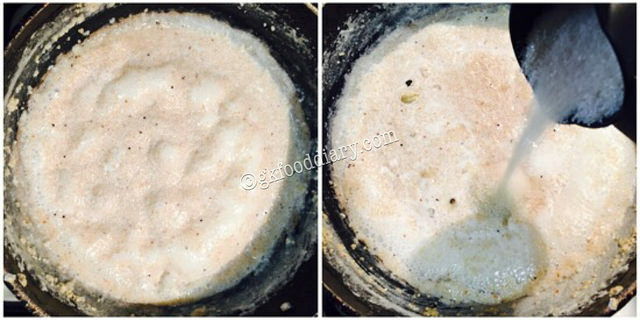 Here is how to make tasty rajgira kheer recipe for babies, toddlers and kids. 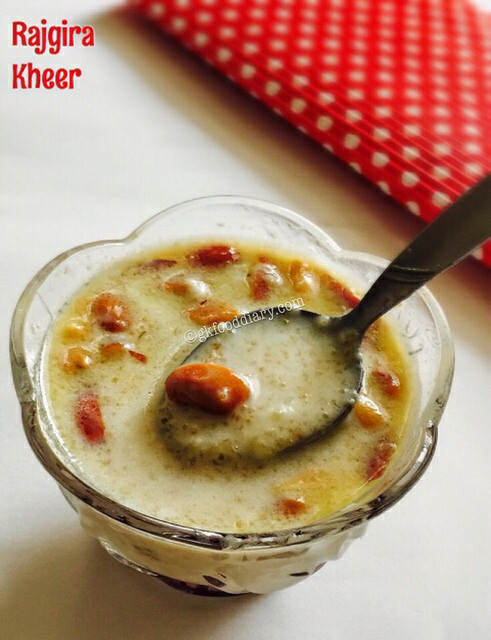 Rajgira Kheer - Healthy kheer or pudding recipe with amaranth grains, milk and nuts. Calcium rich kheer for babies and kids. If using un-popped amaranth grains, pressure cook it for 3 whistles in medium flame with 1 cup of water. I used popped ready to cook amaranth grains and hence skipped pressure cooking part. Measure sugar or jaggery, keep aside. If using jaggery, Melt it and strain water to remove with impurities. Take 1 cup of popped amaranth grains in a bowl. Pour milk in a thick bottomed vessel and boil it in low medium flame. Once the milk is boiled, add popped or pressure cooked amaranth grains to it. Mix well and cook everything in a low flame for 5 minutes the until kheer becomes slightly thick. Stir it occasionally otherwise it gets stick to the bottom. 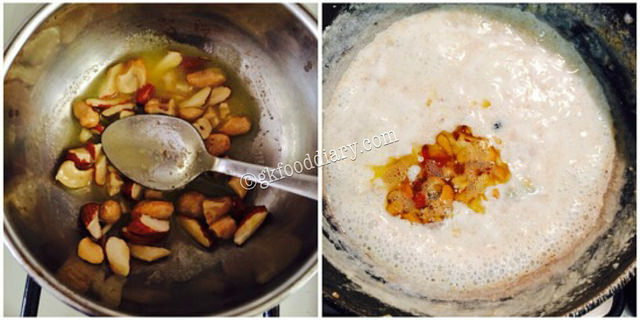 Then add powdered cardamom, sugar or powdered jaggery or jaggery syrup (if using) .Mix well and cook it further for 2-3 minutes. 1. Take 1 cup of popped amaranth grains in a bowl. Pour milk in a thick bottomed vessel and boil it in low medium flame. 2. 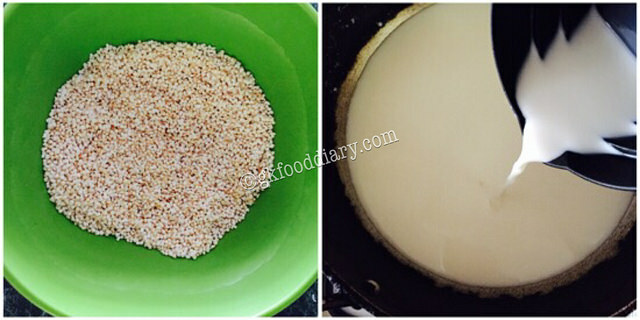 Once the milk is boiled, add popped or pressure cooked amaranth grains to it. 3. Mix well and cook everything in a low flame for 5 minutes until the kheer becomes slightly thick. Stir it occasionally otherwise it gets stick to the bottom. 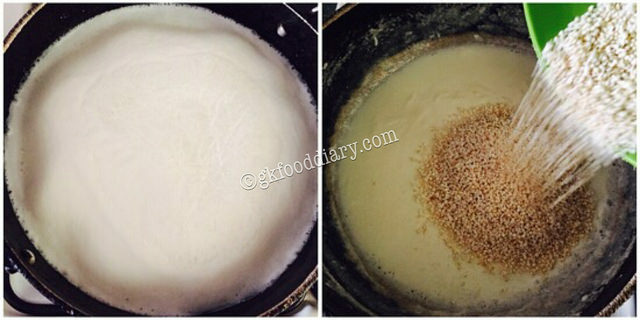 Then add powdered cardamom, sugar or powdered jaggery or jaggery syrup (if using) .Mix well and cook it further for 2-3 minutes. Healthy and delicious rajgira kheer is ready! Make sure to cook the amaranth grains if using un-popped ones. The rajgira kheer becomes thick after cooling down, add warm milk to adjust the consistency while serving. You can also add raisins and saffron to this kheer. Make sure that your baby is not allergic to any nuts before you add to this kheer. Skip milk for babies below one year. Cook it only with water, add breast milk or formula milk once the kheer is warm. You can use any sweetener of your choice. 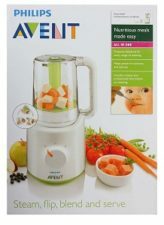 Avoid whole nuts for small babies and use nuts powder instead.